Amirul Mu’minin Sheikh as Sultan Muhammadu Sa’adu Abubakar III is the 20th Sultan of Sokoto. 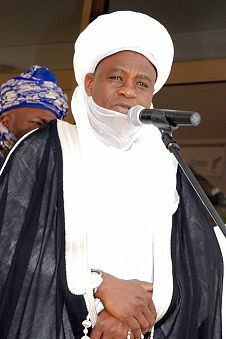 As Sultan of Sokoto, he is considered the spiritual leader of Nigeria’s 85.5 million Muslims, who account for roughly 50 percent of the nation’s population. Although the position of Sultan of Sokoto has become largely ceremonial, the holder is still a central figure for Nigerian Muslims. Lineage Back to Sheikh Usman Dan Fodio: The Sultan of Sokoto is the spiritual leader of Nigeria’s enormous Muslim community. He gains this position by lineage. Abubakar is the 20th heir to the two-century-old throne founded by his ancestor, Sheikh Usman Dan Fodio. Dan Fodio (1754-1817 CE) was a scholar, leader of the Maliki school of Islam and the Qadiri branch of Sufism, and Islamic reformer of the nineteenth century. Dan Fodio believed that Islam should have a more central role in the life of the people of West Africa and led an uprising to institute the changes he sought. His figure and his writings are a very important chapter in the history of Islam in West Africa, and Abubakar, by lineage, holds a key place in West African Islam, and particularly for the Fulani and Hausa people who followed Dan Fodio. An Illustrious Family: The position currently does carry with it some weight—though largely ceremonial since British colonial rule diminished its political significance. Much of this clout is derived from the respect that was earned by Siddiq Abu Bakar Dan Usman—17th Sultan and father of Abubakar—who held the Sultanate for over fifty years. The rule of Abubakar’s father from 1938 to 1988 earned the position significant social capital and popularity with ordinary Muslims. Administrative Power: Abubakar holds important administrative influence in Nigerian religious life. Abubakar is the titular ruler of Sokoto in northern Nigeria and is also the head of the Nigerian National Supreme Council for Islamic Affairs. Leadership of this council means that the Sultan of Sokoto remains the only figure that can legitimately claim to speak on behalf of all Nigerian Muslims. This role has become increasingly influential over the years with a rise in interreligious tensions between Nigeria’s Muslim majority north and Christian-majority south. Boko Haram: The Sultan has started many initiatives to counter and reduce the influence of Boko Haram, including inviting an international joint Muslim Christian Delegation to visit Nigeria. Administrative Power: Abubakar holds important administrative influence in Nigerian religious life. Abubakar is the titular ruler of Sokoto in northern Nigeria and is also the head of the Nigerian National Supreme Council for Islamic Affairs. Leadership of this council means that the Sultan of Sokoto remains the only figure that can legitimately claim to speak on behalf of all Nigerian Muslims. This role has become increasingly influential over the years with a rise in interreligious tensions between Nigeria’s Muslim-majority north and Christian-majority south. Boko Haram: The Sultan has started many initiatives to counter and reduce the influence of Boko Haram, including inviting an international joint Muslim-Christian Delegation to visit Nigeria. 1804 CE – is the year the Sokoto Caliphate was founded. 70 million – Muslims look to His Royal Eminence as their spiritual leader.